On the afternoon of November 8, Murad Chia Jei Biotechnology Co Ltd. signed an agreement to enter Songshan Lake, marking the 7th biotech company from Taiwan joining Guanrong Program. The new agreement has further deepened bioindustry cooperation and strengthened the connection and exchange of bio-enterprises between Dongguan and Taiwan. 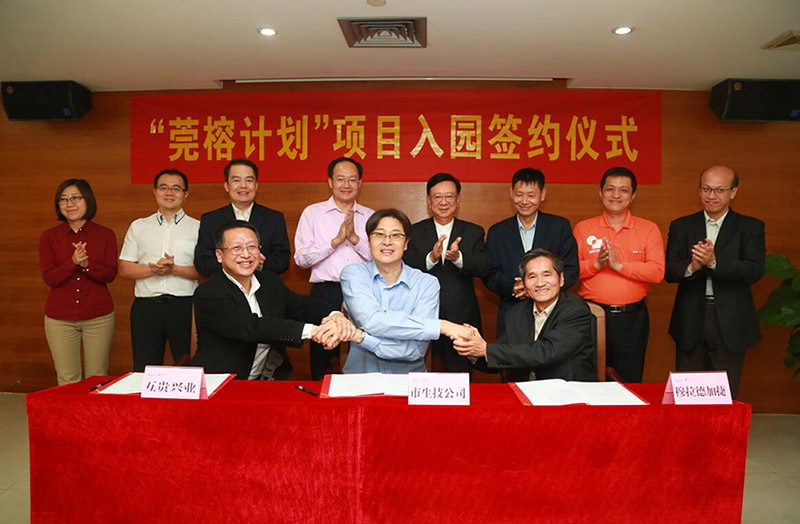 Yin Huanming, secretary of Songshan Lake (Biopark) Party Working Committee and director of Songshan Lake (Biopark) Administrative Committee, Song Tao, adviser to Dongguan Municipal People’s Government, and other officials attended the signing ceremony. It’s understood that Guanrong Program has introduced 7 enterprises to Songshan Lake by far, namely, Hukuibio, MiiS, Taihe, Abnova, GeneFerm, Murad Chia Jei and Sunmax. These enterprises are engaged in medical equipment, in vitro diagnosis (IVD), health products and cosmetics. Dongguan plans to introduce 20 strong, established biotech companies already listed or soon to launch IPO from Taiwan within 3 years to facilitate the industrialization development of biotech industry of Dongguan and Taiwan. Xuan Mingzhi, president of Taiwan Cross-Straits Bioindustry Development Promotion Council, revealed that the complete industry chain and convenient raw material supply of Dongguan would be combined with the leading strengths of Taiwan ICT industry over the years to unfold more cooperation in such segments as online medical care and medical equipment.